Brook er ofte å se på amerikansk TV. When asked why they chose to read “Atlas Shrugged,” 37.6 percent of respondents in the online survey said it was recommended by a friend or colleague, 18.4 percent had it assigned or recommended in school, 9.9 percent read or heard about it in a print/Internet article or radio/TV program, 8.4 percent saw it in a library, and 1.9 percent noticed it in a bookstore. In the past two years, national telephone surveys of about 1,100 people have indicated that 8.1 percent of respondents had read “Atlas Shrugged.” The latest online survey was randomly drawn from a pool of several hundred thousand people while the telephone surveys were drawn at random from larger lists of people who own telephones. People keep forwarding me emails and blog posts saying ABC fired me. Internet forums claim I was fired because I aired a story about the downside of government-controlled health care. This is silly. It's not even logical. No one can broadcast anything on "20/20" without ABC's approval. Tomorrow, finally, my new Fox Business show begins! It will air every Thursday at 8 p.m. (and will repeat Fridays at 10 p.m. -- opposite "20/20" -- heh, heh, heh). The embrace of freer markets has lifted more people out of the misery of poverty than any other system -- ever. The World Bank says that in just the last 30 years, half a billion people who once lived on less than $1.25 a day have moved out of poverty. But now, Wesley Mouch -- I mean, Congress and the bureaucrats -- tell us they are going to "fix" capitalism, as if their previous "fixes" didn't hamstring the free market and create the problems they propose to solve. Who are they kidding? Rand had it right. She learned it the hard way in Soviet Russia. What makes a country work is leaving people free -- free to take risks, to invent things -- and to keep the rewards of their work. On second thought, with Barack Obama heading to Copenhagen promising America will cut its greenhouse gasses by 83 percent (not 82, not 84 -- exactly 83), I may do my first show on global warming. I'll decide tomorrow -- when I begin my new career. Morsomt at det står at boken er Siv Jensen sin favorittbok. Skulle gjerne likt og visst hvor Jensen er grunnleggende uenig med Rand og høre henne argumentere ut i fra et moralsk synspunkt. Recent headlines seem lifted directly out of an Ayn Rand novel. President Obama decries the “fat cat bankers on Wall Street”. Harry Reid attacks insurance companies for making too much profit. House Democrat leaders call Tea Partiers “Racist, Nazi, Gun Nuts”. How about this nauseating statement made by Army General George Casey after the Muslim terrorist attack on Ft. Hood? Each of these headlines might well have been uttered by an Ayn Rand character. Rand, whose father’s pharmacy was confiscated by the Soviets during the communist revolution of 1917, and who came to America in 1926, seems uniquely able to speak to us about the inverted morality of our times. Virtue is to be apologized for. Depravity commands respect. Success is cast as evil and punished while failure is blamed on others and rewarded. Rand’s insights into the psychological state of collectivists - those who demand that we sacrifice our individual freedom and happiness for the sake of the state - explain what often seems incomprehensible to thinking people. John Galt, the industrialist hero of Rand’s 1957 masterpiece, Atlas Shrugged, refers to those in power who stripped men of their minds, wealth and freedom, as mystics. The mystics of spirit were the religious leaders of centuries past who proclaimed that faith is superior to reason. Galt is no fan of these mystics but it is the mystics of muscle - the progressives who force us to submit to their version of the common good - that Galt despises. A living entity that regarded its means of survival as evil, would not survive. A plant that struggled to mangle its roots, a bird that fought to break its wings would not remain for long in the existence they affronted. But the history of man has been a struggle to deny and destroy the mind. ● Who but the mindless can believe that government run health care will reduce costs and improve care while covering more people? ● Who but the mindless can believe that this President is now serious about reducing the deficit after shattering spending records during his first year? ● Who but the mindless can take seriously the sham “jobs summit” held by a President whose every policy is a lesson in job destruction? ● Who but the mindless can believe Obama’s lie that “Cash for Clunkers” which cost taxpayers $24,000 per car was successful? ● Who but the mindless would not outraged that our government has reneged on its promise pay back the unused TARP fund to taxpayers? ● Who but the mindless would not question the morality that the world’s finest health care, which has extended and improved human life in unimaginable ways - conceived and produced by countless unsung heroes in the private sector - should magically be transformed by Harry Reid and Nancy Pelosi into a “human right”, taken over by the state and rationed out as they please? The mind is an attribute of the individual. There is no such thing as a collective brain. By the grace of reality and the nature of life, man - every man - is an end in himself, he exists for his own sake, and the achievement of his own happiness is his highest moral purpose. 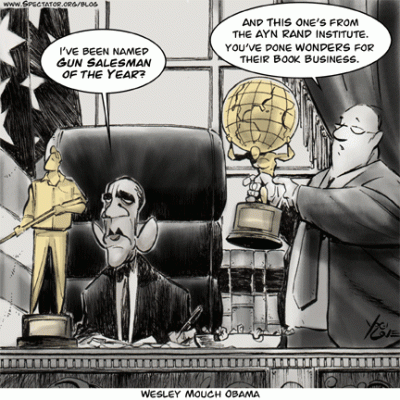 The novel's chief villain is Wesley Mouch, a bureaucrat who cripples the economy with endless regulations. This sounds familiar. Reason magazine reports that "as he looks around Washington these days," Rep. Paul Ryan "can't help but think he's seeing a lot of Wesley Mouch". So I'm conducting this unscientific poll: Who is our Wesley Mouch? Hank Paulson? Tim Geithner? Barney Frank? You can vote here. Personally, I think Chris Dodd's ridiculous financial proposals ought to win him the honor. But he isn't among the choices on Fox's list. As I write this, Geithner, President Obama and Barney Frank lead the voting. My first guest on the show (FBN, 8 p.m. Eastern Thursday, repeating at 10 p.m. Friday) is BB&T Chairman and "Atlas" fan John Allison. Allison's bank, the ninth largest in America, is doing very well, but he's angry the government forced him to take TARP money. I'll pack the audience with some "Atlas" haters. That shouldn't be hard. My daughter's boyfriend offers up his Yale classmates. Many "liberals" agree with the "South Park" episode in which one character said that "because of this piece of s--t, I am never reading again." Rand brings out ferocious hatred in some people. Fourteen states have banned fish pedicures, claiming they are unsafe, and other local governments have proposed bans. OK, compared to the assault on entrepreneurship described in "Atlas Shrugged," this is sort of a dumb example, but look -- I work in television -- dumb examples can make good points. In fact, the free market sorts such things out far more efficiently than bureaucrats. It's just not good business to hurt your customers. My 30 years of consumer reporting taught me that businesses rarely do this, and -- here's the market's self-regulation -- those that do don't stay in business long. That's not a perfect system, but it's much better than central planning. Had today's bureaucrats been in charge decades ago, they would have banned things like aspirin, cars and airplanes. Kaller ikke DLF-lederne seg objektivister, til tross for at Ayn Rand ikke lar tilhengerne bruke den tittelen? Dette ville i så fall ikke samstemme med ting hun har skrevet andre steder. Såvidt meg bekjent ba hun simpelthen om at man kun skulle kalle seg "Objektivist" hvis man var det fullt og helt. Hun ønsket formodentlig ikke at begrepet skulle flyte ut og bety ti forskjellige ting, slik for eksempel "liberal" gjør i dag. OK. Slik jeg forsto det ville hun ikke at folk skulle være helt enig med henne, da dette ville medføre at de stjal ideene hennes. dassrull skrev: Kaller ikke DLF-lederne seg objektivister, til tross for at Ayn Rand ikke lar tilhengerne bruke den tittelen? Mange av de sentrale i DLF er Objektivister. En Objektivist er en som er enig i Objektivismen. Det er riktig at en gang for lenge siden, lenge før det fantes mye skriftlig materiale som fremstilte hva Objektivismen besto i, mente Ayn Rand at de som studerte hennes ideer burde kalle seg "students of Objectivism". Men siden det Objektivistiske korpus nå er meget omfattende og ferdig, så er det ingen nå som sier at de som er enige i Objektivismen ikke kan kalle seg Objektivister.